Heat oil or ghee in a saucepan. Add mustard and black cumin seeds and fry till mustard seeds pop. Add curry leaves and gently fry. Then, lightly fry ginger and garlic and add powdered spices and carefully cook on low heat for 1/2 minute. Stir in potatoes and carrots and cook on low heat for 5 minutes. Add 2 cups water, salt to taste, and cook for further 5 minutes,on medium heat then add cauliflower and greens. 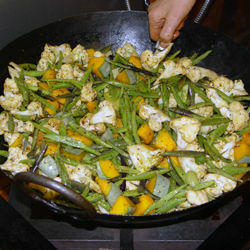 Continue to cook on low heat until vegetables are cooked, yet still retain their shape. Mix through finely chopped coriander as an option.